We don’t want summer to end too soon but we do want to plan for the inevitable change of the seasons. 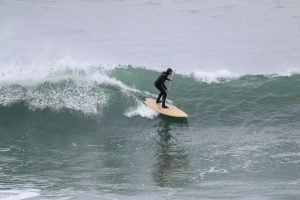 The fall season here in the Northern Hemisphere is when many woodworking enthusiasts are planning winter projects, and building a hollow wood SUP (standup paddleboard) or surfboard is a great way to spend some of those long, dark nights and wet, cold weekends…and you’ll end up with a beautiful new board to use when you are finished! http://clearwoodpaddleboards.com/why-build-hollow-wooden-boards/ When we launched Clearwood Paddleboards in the fall of 2013 we had built quite a few strip planked hollow wood boards and we shared our knowledge of the process with our customers and others interested in hollow wood paddleboards. Much of the process remains the same for us but some things have also changed. We’ve a learned some new tricks and ways of creating these watercraft and want to share that knowledge. The best format we’ve found for standup paddleboard building tutorials is a series of video, times lapse sequences and still images with text overlays that highlight the entire process, start to finish. We’re going to make this information available through our website and our YouTube channel, and are nearly ready to publish our first few episodes in the series. Learning any new skill takes commitment. So, for those of you with some woodworking experience who are unsure if you have enough to build a strip planked SUP or surfboard, this series will provide you with an overview. I have always said to potential builders that these projects can be challenging, but with basic woodworking skills and commitment to the process you will succeed. That being said, we know that there are times when it would be good to have a technical mentor and we also provide ongoing builder support via email or phone.